Insect Antenna or Plant Fragment? I noticed this weird little object on a rock in my collection from the famous Talbragar Fish Beds (late Jurassic of Australia) and I was wondering whether it might be a feathery insect antenna or just a small bit of plant. Both plants (conifers and ferns mostly) and rare insects are known from the site. It measures only 5 mm long and I have done a quick drawing of it to show the form easier. Note the double branching tips on the lower filaments. I'm leaning towards plant as I haven't seen any feathers with barbs branching from barbs and it's not the right shape for insect wing (insect wings also generally have more of a setal base attachment, I believe the term is-more support for the wing). I'm tempted to say leaf, but there other plant structures that one would need more knowledge of before ruling out. + 1 For plant pinnule/leaflet. 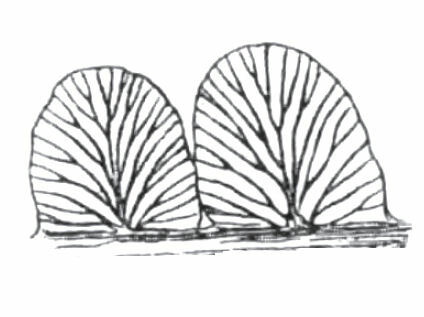 The thing that is confusing me about it being a leaf is that there is no edge going around the structure, it might look like it at first glance but it's an optical illusion, it seems to be literally just the filaments like what i have drawn above. I have lots of other plant fossils from this site, big and small, and they all have clear defined edges and a different style of preservation (replaced by white opaline silica so that they stand out very clearly from the orange oxidised rock). What kind of leaf just has 'free-floating' filaments like that? ****EDIT- Hahaha just beat me Piranha! Cheers! Pinnules short, bluntly rounded, alternate or opposite, attached by whole base, separate or connected by narrow lamina along rachis, up to 8 mm long and 6 mm broad, margins entire. Midrib well defined, not reaching to apex, but breaking up into a number of veins. Secondary veins come off from midrib at an acute angle, and divide dichotomously once or twice. Towards the base of the frond the pinnules become more rounded and their midrib less prominent. Mesozoic floras of New South Wales: I. Fossil plants from Cockabutta Mountain and Talbragar. The actual pinnule is not present, only an impression is preserved. Have you tried Robert Beatie? He's the resident insect expert. He'll know for sure whether its insect or not. Kitchen table expert here: I just took a peek at a modern dragonfly's wings, and a paper wasp's wings. The group , although small, would seem to include a considerable span of evolutionary time. The vein pattern in each is considerably more complex. Id say that Piranha hit the nail on the head with this one, but how in tarnation does one find something soooooooo small? My eyesite is not the best and I would have tossed that chunk of rock without knowing that was even there. how in tarnation does one find something soooooooo small? My eyesite is not the best and I would have tossed that chunk of rock without knowing that was even there. Looks a lot like some moss I have seen. But I do not know what it is.